Why do we Use BG On The Road® Plus? Nolan&apos;s Auto Service located at 644 Williamson Ave in Fullerton, CA is a BG Product Protection Plan Auto Service Location® center, which means you&apos;re covered by our Nationwide Warranty. BG Protection is available throughout the U.S., Puerto Rico and Canada and offers up to $100 US in roadside assistance (per event, limited to two events) for four months. If the tire is repairable, you can be reimbursed for up to $20 US. If the tire is not repairable, replacement is up to $150 US. Tire Hazard is only available with BG On The Road® Plus roadside assistance. BG On The Road® roadside assistance does not include Tire Hazard. Schedule a quality BG Automotive Maintenance Service and score complimentary roadside assistance today! BG fuel products restore fuel economy, reduce environmentally damaging exhaust emissions, and restore the fun of like-new drivability to your vehicle. Not sure if you want to invest in a BG Automotive Maintenance Service? The Lifetime BG Protection Plan will help you make that decision. The high-quality BG Automotive Maintenance Services listed below are backed by the Lifetime BG Protection Plan. That means, for example, if you get a BG Fuel System Service, repair of the lubricated parts in your Fuel System, it will automatically be covered for up to $4,000! * How’s that for peace of mind with your investment? 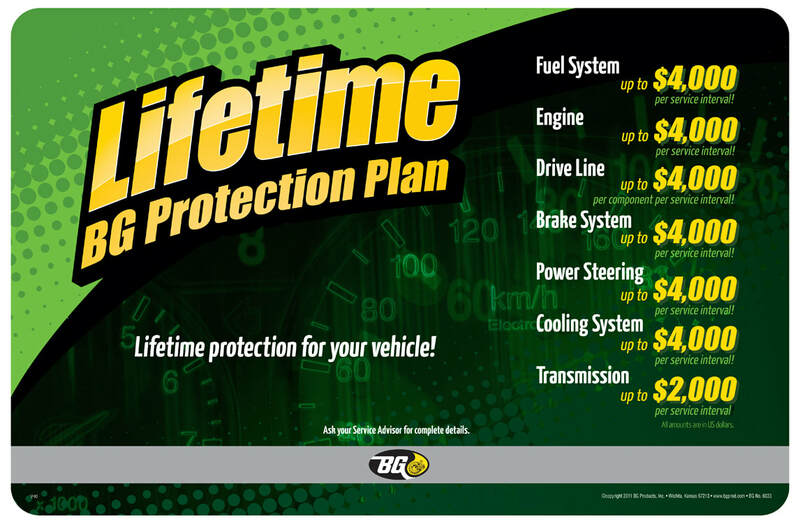 ​The Lifetime BG Protection Plan covers seven major systems: fuel, engine, transmission, drive line, cooling, power steering and brakes.